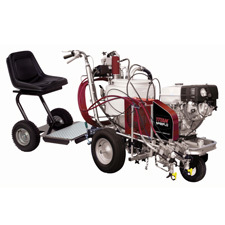 Graco & Titan Striping Machines Offering a full line of sprayers. 1 and 2 gun units. Offered in multiple confugurations. Designed for Stripe Traffic Paints, this easy-to-use machine applies crisp, even 2” to 4” lines to concrete or asphalt. Designed for use with Stripe Athletic Field Paints. Allows application of lines up to 2” to 4” on athletic field or other turf surfaces. Features larger wheels. For use with all Stripe inverted tip marking paints this light-weight tool is ideal for a wide range of marking applications. Compact and lightweight, this tool is ideal for free-hand marking with any stripe inverted tip marking paint. A specially formulated field marking paint that does not harm grass. Water-based acrylic paint that can be applied to freshly applied pavement sealers (allow 24 hours for sealer to cure). Available in white, yellow, handicap blue. Formulated for heavy duty application in high traffic areas. Offers maximum adhesion and durability. Ideally suited for asphalt or concrete. Do not apply to fresh sealer. High solids traffic paint ideally suited for asphalt or concrete. Do not apply to fresh sealer. A heavy duty general purpose construction marking paint available in Fluorescent Red for bright, durable markings.